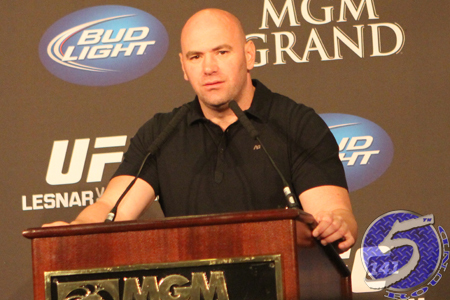 According to UFC president Dana White (Pictured), the fourth time will indubitably be the charm. After seeing mixed martial arts get denied entry into the state of New York for three consecutive years, White told MMAFightCorner.com they will definitely break the seal in 2012. This past June, the bill to sanction MMA was left off the New York Assembly’s agenda – despite the fact New York’s State Senate voted a resounding 42-18 to pass Bill S.1707-A the month prior, crushing the 32-26 passing score it received in 2010. In November, the Ultimate Fighting Championship and a group of plaintiffs including fighters, fans, trainers and others involved with mixed martial arts filed a lawsuit in U.S. District Court against New York State officials challenging the constitutionality of the state law banning live professional MMA events and associated activities. There have been no updates on the type of impact the suit has made in swinging the pendulum. However, the UFC secured a blockbuster broadcast deal with FOX since the last time New York shunned MMA, and that type of mainstream acceptance could go a long way in generating change. White has no idea which scrap will serve as the UFC’s featured attraction if his prophecies come to fruition, but he made no bones about wanting to showcase his reigning light heavyweight champion in The Big Apple.